Tucson Sing-In Inc.: About the "Messiah"
"For the first time in musical history the mighty drama of human redemption was treated as an epic poem." Handel, suffering partial paralysis on his left side due to a stroke, composed Messiah in 21 days - an incredibly short period of time. Handel had been invited to give a concert series Dublin, to benefit various charities. 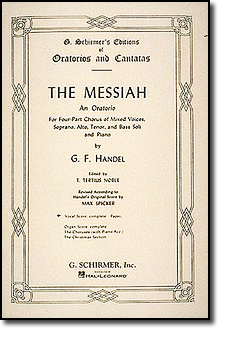 The premiere of Messiah was met with great success and boosted Handel's spirits for a return to London where George II stood up during the singing of the mighty "Hallelujah" Chorus at the second London performance. Although this was a great moment, Messiah still did not enjoy the popularity of many of Handel's other oratorios during his lifetime. The Messiah is divided into three parts which represent Christ's birth, death and resurrection. For more than 250 years now, this great and popular piece still holds its extraordinary grip on the musicians playing and singing as well as the audience members alike.